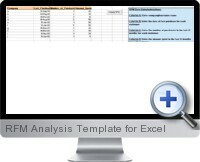 The Excel RFM analysis template is an automated Excel dashboard for analyzing, frequency and monetary metrics (RFM) of customer source data. The template analysis converts the data into RFM groups which allows segmentation for ranking based on RFM scores. The source customer data takes the form of name, purchase date, number of purchases and order amount for each customer. The RFM analysis then automatically updates to new or changed data with filtering options to quickly isolate and analyze RFM groups, segments and customers. Recency - when the last time customers purchased. Frequency - how often customers purchase in each segment. Monetary - how much customers typically spend in each group.